Roulette is probably the most popular casino table game around. The return on a bet is very large, if you win. 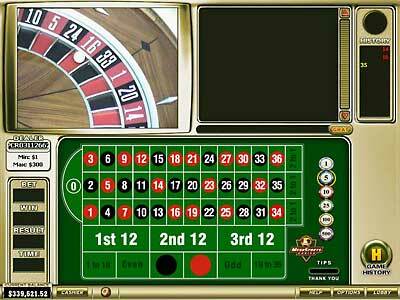 There are two versions of the game, European and American Roulette. European Roulette has 37 numbers on the Roulette wheel - 1 to 36 as well as 0. The wheel for European Roulette has 37 slots. The house advantage on European Roulette is 2.7%. American Roulette has 38 numbers - 1 to 36, 0 and 00. The American Roulette wheel has 38 slots. The house advantage for American Roulette is slightly more than the European version at 5.26%. The game starts of by the players placing their bets on the table. The croupier (the dealer that spins the Roulette wheel and basically runs the table) then spins the wheel and adds the ball to the wheel cavity. At a certain point he announces "No more bets". From this point onwards, no player can add, change or remove any bets that are placed on the table. When the ball drops into a slot on the Roulette wheel, the croupier announces the number and places the "dolly" on the number on the table. The croupier then removes all the losing bets from the table and pays out the winning bets. Each player at the table is given a certain color of chips when he buys into the game that can only be used at the specific table. These chips are then placed, by the player, onto the Roulette betting table. The reason each player gets different colored chips is to ensure that the croupier knows who placed what bet(s) on the table. The player is then "paid" out in the colored chips, but, can also request value chips. These chips have a value printed on them, and can be used at any table that uses chips. They can also be cashed in. After all the winning bets have been payed out, players can then again place bets on the table and the process starts again. Various bets can be made at the Roulette table. Split Bet - This is when a chips or stack of chips are placed on two numbers adjacent to each other. The chip(s) is/are placed on the line that borders both numbers. 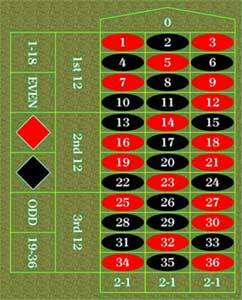 Street Bet - A bet on three consecutive numbers, made by placing the chip(s) on the line at the end of the three numbers line. Corner Bet - This bet is made by placing the chip(s) on the cross of the horizontal and vertical line of the four numbers bet on. Double Street - Made in the same manner as the normal street bet, but only the chip(s) is/are placed so that 6 numbers are bet upon. Odds or Evens - The chip(s) are placed on the blocks that say odd or even. Here the player bets that the number that the ball lands on will be either odd or even. Black or Red - The chip(s) are placed on the blocks with either the red or black color in them. Here the player bets that the color of the number that the ball lands on. 1 to 18 and 19 to 36 - The chip(s) are placed in the corresponding blocks on the table. Here the player bets that the ball will land in the number range. 1st 12, 2nd 12, 3rd 12 - The same principal as 1 to 18 and 19 to 36. The player bets that the ball will land within the range of numbers. Columns - The chip(s) is/are placed at the bottom of the numbers in one of the three blocks that correspond to the column that the player wants to bet on. If the number that the ball lands on is in that column the player wins. When playing Roulette, always ensure that when you place the bet, the chips that are placed are on the type of bet that you want to place! Many a player has wanted to place a number bet and by placing it to close to a line, ended placing a split bet. That type of error can result in the player only winning 17, instead of 35 chips.